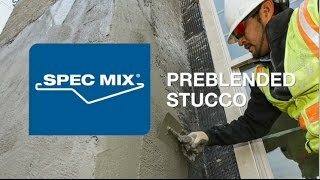 SPEC MIX® Fiber Base Coat (FBC) is a dry, preblended cement based stucco engineered with proprietary admixtures and fibers that are computer batched for consistency and performance unmatched by traditional field mixed stucco. SPEC MIX FBC has a custom blended sand gradation that increases the wall flexural strength while reducing cracking and crazing. The custom sand gradation also provides excellent workability and finishing properties for the applicator over a traditional field-mixed source. Designed for both One Coat and traditional Scratch & Brown Coat systems, SPEC MIX FBC reduces shrinkage and increases long term durability and bond strength of the application. When gun or hand applied by a qualified applicator, SPEC MIX FBC is approved by the International Code Council (ICC) as a one-hour fire rated wall when applied as a One Coat application, ESR 3018. Each SPEC MIX manufacturer certifies that SPEC MIX stucco products are designed to meet the project specifications and applicable ASTM standards. SPEC MIX® Fiber Base Coat (FBC) is a dry, preblended cement based stucco engineered with proprietary admixtures and fibers that are computer batched for consistency and performance unmatched by traditional field mixed stucco. SPEC MIX FBC has a custom blended sand gradation that increases the walls flexural strength while reducing cracking and crazing. The custom sand gradation also provides excellent workability and finishing properties for the applicator over a traditional field-mixed source. SPEC MIX FBC is designed for use in both One Coat and traditional Scratch & Brown applications. SPEC MIX FBC can be applied over Open Framing with Insulation Board. Over – framed wall construction that includes a solid backing: including Fiberboard, Gypsum Sheathing and Wood Based Sheathing. SPEC MIX FBC can also be applied over Concrete and Masonry. SPEC MIX FBC is approved by the International Code Council (ICC) as a one-hour fire assembly when applied in accordance with ESR 3018.